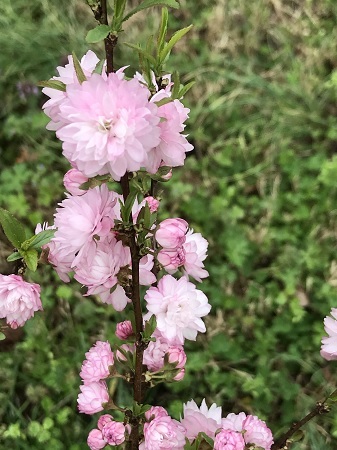 My mother took a clipping from her mother's blooming almond in North Carolina to New Jersey. After my grandmother had passed, I visited my mother's home in New Jersey from North Carolina. I saw this beautiful plant growing. When my mother told me the clipping came from her mother's yard where I lived in North Carolina, I thought I had to have a clipping also. I took a clipping back home to North Carolina with me and rooted it. It was mistakenly mowed down twice but after two years and persistence I got it to grow; the shrub is now 3 feet tall and blooming beautifully. I love the tiny powder pink blossoms. I am going to try to root some more as I love this tiny little shrub. The flowers it produces are spectacular, and I will always remember that my grandmother, my mother, and I share the same plant. And I hope one day my sister will take pride in knowing that her sister, her mother, and her grandmother all had the same plant she will have too.